San Francisco in 1940 is a haven for the unconventional. Tourists flock to the cities within the city: the Magic City of the World’s Fair on an island created of artifice and illusion; the forbidden city of Chinatown, a separate, alien world of exotic food and nightclubs that offer “authentic” experiences, straight from the pages of the pulps; and the twilight world of forbidden love, where outcasts from conventional society can meet. Six women find their lives as tangled with each other’s as they are with the city they call home. They discover love and danger on the borders where magic, science, and art intersect. 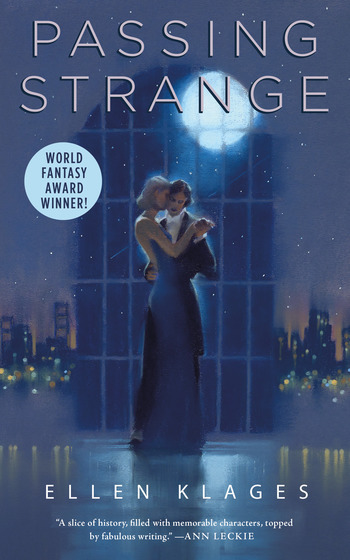 “Passing Strange is a passing subtle, detailed intergenerational fantasy with a pulp influenced story and a literary sensibility full of the past and the artefacts it leaves behind. Queer history, San Francisco history and a pinch of Weird Tales." —Geoff Ryman, winner of the Clarke, Nebula and World Fantasy Awards.